The area that was to become Ramsey County was part of the Dakota Territory, which was formed in 1861, and included North and South Dakota, Montana and Wyoming. In 1864 the latter two became the Montana Territory. In 1873 the Dakota Territory was divided into North Dakota and South Dakota. Pembina County, which had been formed from Indian lands, was divided into seven counties, one of which was Ramsey County, which contained Devils Lake. The county lines were redrawn again in 1883. 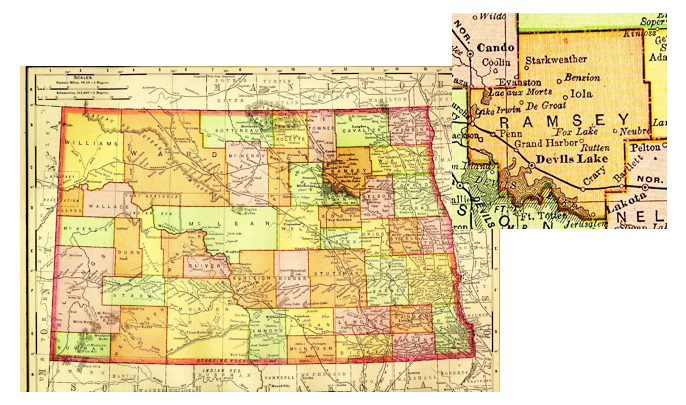 In 1889 North Dakota became our 39th State. Although Dakota Territory was opened to settlers in 1863, prospective settlers stayed away because of the Civil War, Indian Raids, the financial panic of 1873, reports of blizzards, droughts, grasshoppers and the absence of transportation. In 1862, Congress passed the Homestead Act, which offered a free 160-acre tract of land to anyone over 21 who would live on it for five years, cultivate and improve the acreage. Still, settlement remained slow. This changed when the Northern Pacific and Great Northern Railroads began laying tracks across North Dakota. In 1869 Dan Eisenberg opened a trading post South of what is now Bismarck, along the Missouri River. When Bismarck was founded, he became one of its early merchants. He may be the first Jewish settler in North Dakota. Plain Folks – North Dakota’s Ethnic History, Sherman, Thorson, eds. Also, gold was discovered near Bismarck in 1874 and that event drew Jews and non-Jews alike. The first Jewish farmers were members of the Thal family who arrived in 1876 and settled at Lakota in Nelson County, west of Grand Forks. As the plans to build a railroad became known, many people, including Jewish entrepreneurs, bought up land hoping that the railroad would need their land for development. This also increased the Jewish and the non-Jewish population in the State. Imagine how it would have sounded to new or potential immigrants. The Baron de Hirsch Fund was promoting farming and states like North Dakota were offering free land. They had an opportunity to own land, which they could never have done in Russia. It must have sounded like the door to the American dream. A homestead would offer a great deal of hope for the future. They could have economic and personal freedom. Of course “free” land wasn’t really free. At the going estimate of the time, equipment needed to till the land required an initial capital outlay of $1120 dollars in 1890 values. And then still more money was needed for harvesting equipment, fencing, water supplies etc. Agencies located in Chicago and in New York as well as the Twin City communities loaned money and provided supplies such as seed to try and get the early farmers started. Still, many went into debt, which added to the failure rate. In an Editorial from the Fargo Forum, March 12, 1913 on Jewish Farmers in North Dakota, it stated that there were 7,500 Jewish farming families in the United States. The largest number of Jewish farmers were in New Jersey, Connecticut next, then New York and then North Dakota. The peak year for Jewish farming in North Dakota was 1910. At that time there were 1200 people on 250 farms. Many, if not most, of the Jewish farmers sold their land after the requisite five years and moved to cities and towns. The extension of the Northern Pacific Railroad encouraged Jewish families to move to towns along the railroad and open businesses to serve travelers, railroad workers and farmers. By 1927 over 75 percent of the 2000 Jews in North Dakota lived in the state’s five largest population centers – Bismarck, Fargo, Grand Forks, Devils Lake and Minot. The information came from the annual report of 1913 of the Jewish Agricultural and Industrial Aid Society of New York. The society was established to promote farming among Jews and to give financial assistance to Jewish families who wish to become farmers. The German Jews had settled earlier in the United States. As a group, they were better educated and more affluent. They had mixed feelings about the huge emigration from Russia of Jews who were poorly educated, did not speak English and needed a great deal of help just to get started. There was a general sentiment among the German Jewish population that there were too many Jewish refugees settling in large cities. There were two problems: First, life was often hard in the cities and second, it was felt that this concentration of Jews in large cities might increase anti-Semitism. Rabbi Wechesler, a St. Paul Rabbi, was very much in favor of promoting the agricultural settlement idea. It would allow for some Jewish occupational redistribution and it would relieve the pressure on the Jewish community in Minnesota who were judged unable to absorb large number of newcomers. Therefore, Rabbi Wechsler obtained a grant in Burleigh County in North Dakota on the Missouri River in 1882. Priority was given to Russian immigrants already living in St. Paul. The settlement consisted of eleven original families, refugees from Russia, who took advantage of this land grant. Rabbi Wechsler gave $600-$800 to each family from the National Jewish Community, (which could have been from the de Hirsch Fund) as the local community could not provide very much. He formed the Hebrew Aid and Emigrant Society of St. Paul and was its President. The new community was called Painted Woods. It was located six hours from Bismarck by horse. Unfortunately, the Painted Woods colonists were handicapped by inexperience, shortage of funds, a hard winter, prairie fires and internal dissension. Neighboring farmers at first welcomed the Russian Jews and the merchants of Bismarck, Jewish and non-Jewish, provided credit. Farming was difficult everywhere in the United States for Jewish immigrants. The winter of 1882-83 was particularly severe in the Dakotas. The cold was so intense that the kerosene would freeze in the lamps, and one’s very breath would congeal on the pillow at night. Severe blizzards raged that winter. These blizzards were of such intensity it made even the short trip from house to barn a hazardous journey. One of the survivors relates how some of the colonists used ropes, one end fastened to the doorpost and the other end tied around the body, to prevent losing themselves in the blinding sheets of ice and snow. For days at a time, the cattle had to go without water. The year 1884 was regarded as its best year agriculturally and at that time there were 54 families. In 1885 the crops again failed. From a summary of Jews in North Dakota from Our Jewish Farmers, the Story of the Jewish Agricultural Society by Gabriel Davidson, L.B. Fisher, New York, 1943. Rabbi Wechsler and Julius Austrian rode a train with several carloads of potatoes, meat and supplies to the settlement and found despairing colonists on bad terms with their neighbors and contention in their midst. The drought of 1886 ended all hope and the settlers drifted away. By 1901 only three Jewish farmers were left in that particular area. The Painted Woods community created a drain on the Jewish community of St. Paul. From 1882 to 1886, St. Paul Jews alone spend $30,000 to aid the Dakota colonists. When there were other settlements needing help, such as Devils Lake, the community was thoroughly drained of their financial resources. No one was more disillusioned than Wechsler. He had seen his dream to near-success. He, more than most, was aware of the tragic side – the hopes and the desperate labors of the settlers. There were undoubtedly many reasons that these families did not succeed as farmers. They had no knowledge of farming and had never done so in Russia; they apparently quarreled amongst themselves and with their neighbors, by whom they were often misused, reproached and despised; they had poor English language skills; their dress and appearance set them apart from their neighbors, many did not want to do physical work and it was thought by some that making them the object of charity did not lead to independence. Also, they had married early, had many children and they were disappointed by life in America and homesick. Aside from the agricultural colonies that were started in North Dakota, approximately 400 other Jewish settlers also came on their own to farm in North Dakota. About the same time that the Baron de Hirsch Fund was used to establish the Jewish Agricultural and Industrial Aid Society in 1900 and the Industrial Removal Office in 1901, Rabbi Levy in Chicago was organizing the Jewish Agriculturists’ Aid Society of America. In 1901 that organization began a ten-year relationship with the Baron de Hirsch Fund, serving as a midwestern base for the New York agencies. Ultimately the New York organization felt that the Chicago organization was too optimistic about the potential success of Jewish farmers in North Dakota and they broke off their relationship. Both organizations had the same goals: 1) Reduce the concentration of Jewish immigrants in urban ghettos by dispersing them throughout the country and 2) Remove a stereotype by proving that Jews were capable of physical productive labor not merely commercial or financial dealings. The Chicago based organization sent 144 families to 26 townships in counties throughout North Dakota. The Chicago agency understood that Jews needed to live near other Jews if this experiment had any hope of success. The Chicago agency also subsidized the work of the Jewish Chautauqua Society which sent reading materials in Hebrew, Yiddish and English on Jewish history and religion. The Society published “The Jewish Farmer,” a Yiddish agricultural monthly newspaper, beginning in May 1908. Its purpose was to be an educational tool and a public forum. It included articles from other magazines about farming and a question and answer column all written in Yiddish. Despite the hardships and failures a Jewish revival occurred. Painted Woods was just the first settlement. Between 1882 and 1910, 400 men and women, representing 250 families, filed for land in seven different colonies. By 1912 these families possessed about 5000 acres which were valued at half a million dollars.